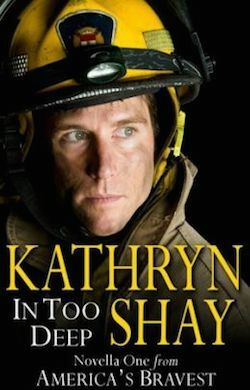 IN TOO DEEP is the first novella in Shay’s powerful, new six-novella anthology, AMERICA’S BRAVEST. In the Hidden Cove Fire Department, Gabe Malvaso is a favorite among firefighters. He’s tough, fair, has a good sense of humor and loves his work. But for eighteen months, he’s avoided a member of his crew, Firefighter Rachel Wellington, despite his knife-sharp attraction to her. She is also drawn to him but is equally determined to keep things professional between them– until they’re trapped in a basement for a day, thinking they’ll never be rescued. Then, their feelings for each other explode like the building around them.